In 2009 Bill Savage started a grist mill operation which would grow, cure and grind an heirloom variety of Indian corn known as “Bloody Butcher” c.1840 DNA. The project quickly flourished, allowing Mr. Savage to sell his cornmeal to local, natural and historic distributors including Whole Foods and Monticello. A few years later, in the Spring of 2013, Bill brought in his local antique tractor club for a fun “plow day” to help plow his corn field. With the ground turned up, his brother Bob Savage took the opportunity to use his metal detector to search the field. Soon, a large piece of metal was detected –it turned out to be an 18th century barrel hoop. More investigation unearthed clam and oyster shells with both halves still together. With this discovery, the brothers went to work and unearthed an intact 18th century brick lined cellar. In the weeks and months that followed, the Savages also located another brick lined cellar, five trash pits and four early brick foundations. 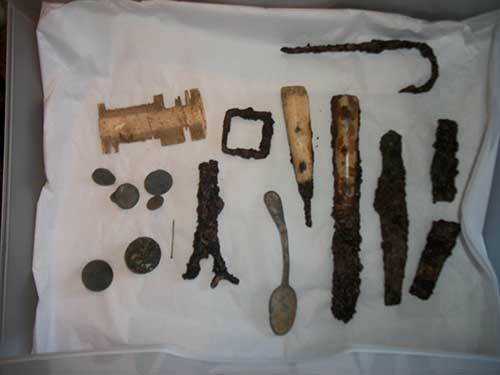 It was a veritable treasure trove of early 18th century artifacts. While the brothers excavated and preserved the contents of the two cellars and part of one pit, they soon realized the historical significance of the site. At this point, they decided to find professional archeological help. 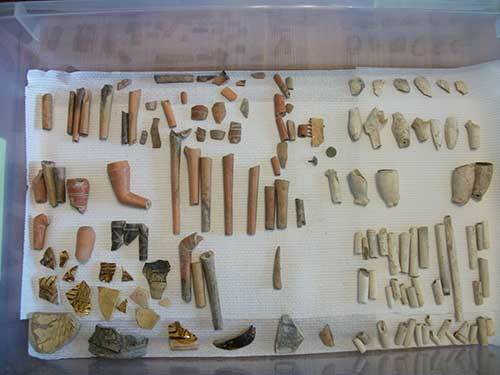 Note: In the two months they were actively digging on the site, they preserved ten cases of artifacts. Several archaeologists have since been in contact with Mr. Savage, and have inspected the collections. It has been determined that the site was a “first contact” site between the English and the Indians. Further research has revealed that it also belonged to the Savage’s 12th great grandfather Richard Kellam who patented the land from the King of England in 1662. This lost Tobacco plantation turns out to be part of their family heritage –that is, the Savages have been planting corn on the same land once worked by their Eastern Shore forefathers. Excavations have also turned up a large collection of 17th and 18th century clay pipes, which created the inspiration for the Old Dominion Pipe Company which manufactures historically accurate corn cob and clay pipes. The corn cob pipes are made from surplus Indian corn cobs. Last year, a new clay studio opened which manufactures replicas of the 17th and 18th century pipes that are part of the current archeological collection. An archeological dig, sponsored by the Historical Society of the Eastern Shore, will be taking place on June 18th at Bill Savage’s Pungo Creek Mills. The 60×40 dig site has been pre-gridded. 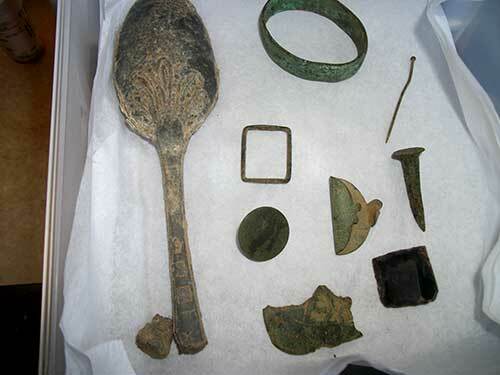 All artifacts recovered will be preserved and stored on the farm in preparation for the future museum. This is such an exciting project for interpreting ES history. The Savages are to be commended for their commitment to preservation of this important early site of English settlement. The Savages are destroying a valuable archaeological site. They know nothing about archaeology and might as well use a backhoe. This is a real loss for eastern shore archaeology and history. Esva historical society should be ashamed of their incolvemwnt. I have found the Savages very open to learning how best to preserve their site. If you have information or contacts that would help them I urge you to please offer that help. Thank you. #1 This is their property, #2 They are doing everything possible to do this right, #3 They want to share all this extremely valuable information with the public in a museum sometime in the future. You know nothing of the Savage’s, their integrity and love for history! If you were not ashamed of your post, you would have used your proper name as all the other posts have! I truly hope that you are not an archaeologist. It is people like you with attitudes like yours that cause many sites to be lost or destroyed and give real archaeologists a bad name. No one is going to let someone with your attitude work on their privately owned site. The last thing you ever want to do is to confront and falsely accuse a land owner of destroying something that he or she legally owns in the first place. Not to mention the fact that in our case the artifacts once belonged to our ancestors. Bob and I have worked toward preservation of the artifacts and the site from the beginning. Our biggest problem has been a lack of participation from the archaeological community and we had suspended any work on the site for three years until the Eastern Shore Community College and now a State Regional Archaeologist have offered to help us. What we need to move this project forward is cooperation from those in a position that could potentially help the project and or fund the museum. We could have ripped the site apart and horded the artifacts so that no one would ever see them or know the historical treasure we are blessed to own, but we chose to preserve them for the Eastern Shore and future generations. On the contrary, if we do not preserve this site now, it may well become a future subdivision when we are long gone and if that time ever comes, the contractor’s backhoe won’t be very kind to it! Had a great dig today! And Ed, no back hoes or bull dozers, just lots of dedicated Eastern Shore history lovers and pros. Many interesting finds! Thanks to all who supported us in preserving this exciting and extremely important historical site! Thanks also to ESVA Historical Society for supporting this project. You are right John. ESVA has certainly been instrumental in getting our dig reestablished. My apologies for inadvertently leaving them out of my previous post. This is so exciting! I’m sure the Shore holds many historical treasures waiting to be discovered. Thank you Wayne. Great Article and I love the painting on the cover! The Savages are to be commended for wanting to preserve their history and share it with all of us that are interested and hoping they find many more things.